Israel’s assault on the Gaza Strip in 2014 was unprecedented in its scope and brutality. Two years on, and many key issues surrounding the offensive remain poorly understood. Is Gaza still occupied? How and why did Israel launch ‘Operation Protective Edge’? Did Israel’s armed forces commit war crimes? Does Hamas use human shields – and what about the rockets? 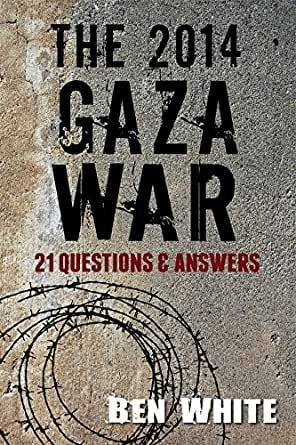 In this concise, well-sourced book, these commonly-asked questions and more are answered by journalist and author Ben White, a regular contributor to Al Jazeera, Middle East Monitor, Newsweek Middle East, Middle East Eye, and other publications. ‘The 2014 Gaza War: 21 Questions & Answers’ is a must-read for diplomats, journalists, students, human rights activists, and anyone seeking to get to grips with the situation in Palestine/Israel. With a foreword by University of Exeter-based Israeli historian Ilan Pappe, this is an indispensable resource for understanding both the events of ‘Operation Protective Edge’, the Gaza context more broadly, and the ongoing Israeli military occupation.